A Florida man was arrested during an Orlando traffic stop because white flakes found in his car tested positive as crystal meth. It turns out, the flakes were just icing crumbs from Krispy Kreme donuts. According to the Orlando Sentinal, Orlando police were staking out a 7-11 when the saw a man enter the story then leave with an employee. They followed the man who, according to police, failed to come to a complete stop at a stop sign and then drove at a speed of 42 mph in a 30 mph zone. I recognized through my 11 years of training and experience as a law enforcement officer the substance to be some sort of narcotic,” the officer wrote in her report. 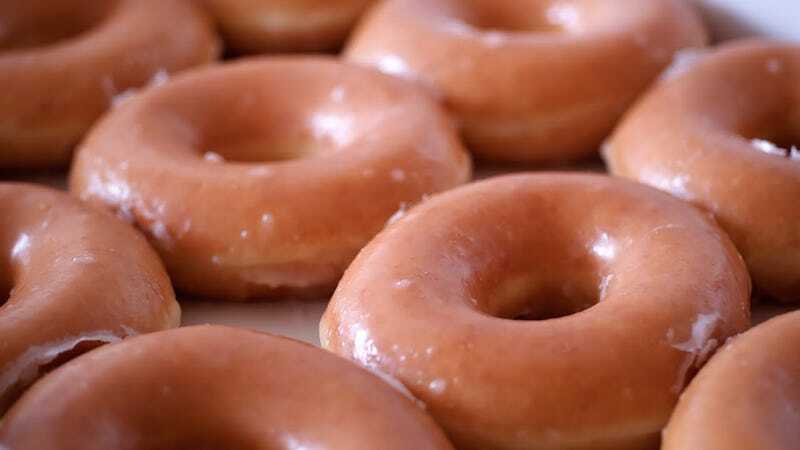 The driver, 64-year-old Daniel Rushing insisted that substance was just donut flakes from a recent Krispy Kreme run. However, a roadside test revealed that the substance tested positive for methamphetamines. Daniel Rushing was arrested, charged with possession with a weapon. He was strip-searched and jailed in December. Several weeks after his arrest the crime lab revealed that the substance was not a narcotic. The prosecutor’s office dropped the case, but Rushing has hired a lawyer and is seeking damages from the city. According to a New York Times report citing the Florida Department of Law Enforcement lab system, 21 percent of roadside drug tests given by Florida law enforcement incorrectly identified a substance as methamphetamines. Orlando police offered no explanation as to why the roadside test revealed the false positive.